This newly remodeled 3-bed, 2-bath vacation rental house will serve as your next Edmond home-away-from-home! Nestled just 25 minutes outside of Oklahoma City, this cozy abode offers numerous amenities, including a furnished patio, gas grill, and a fully equipped kitchen - creating the perfect stay for 6 guests in beds and room for 2 more. Whether you're traveling for business, events at the Cox Convention Center, or a Thunder basketball game, you're bound to fall in love with this southwest gem! Make yourself at home in the 1,500-square-foot interior of this quaint Oklahoma property! New renovations have created a beautiful haven that you'll love returning to after a day in the city. Kick back and relax while watching your favorite shows on one of the 4K flat-screen Smart TV or unplug as you get lost in a new book! Thinking of eating out? Surf the web with the wireless internet access in search of a local restaurant. If you prefer to stay in, you'll find the kitchen fully equipped to handle all of your culinary endeavors! Stainless steel appliances and ample counter space come together to make home-cooking a breeze. There's even a gas grill outside for those at-home barbecues! When the meal is ready, gather the bunch at the dining table for 8, with spillover room for 2 more at the bar. Complete the day with a cocktail or decaf coffee on the furnished patio, while your pup can run free in the fenced-in backyard. Afterward, shower off in one of the 2 full bathrooms before bidding everyone goodnight. Sink into one of the 2 king-sized beds or cozy up in the third bedroom's queen bed. Wherever you end up, you're sure to enjoy a peaceful night's sleep! In the mornings, this quiet neighborhood is the perfect place to walk your dog or simply enjoy a leisurely stroll along the sidewalks! 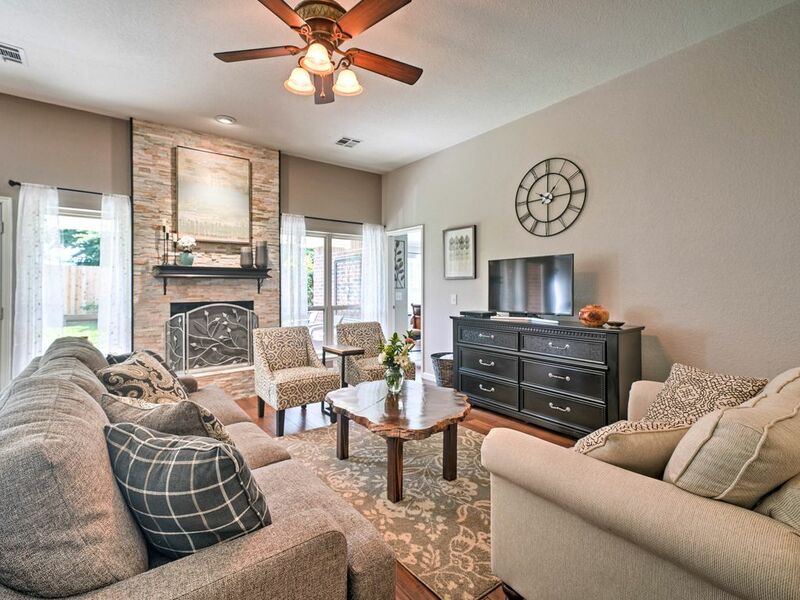 Easily access everything Oklahoma City has to offer from this Edmond home! Just a 25-minute drive will have you immersed in the city's culture, metropolitan luxuries, and more. Business travelers and guests coming for events at the Cox Convention Center will find it also only 25 minutes away! While there, make sure to explore the downtown area, which includes the Myriad Botanical Gardens, Oklahoma City Museum of Art, and Bricktown River Walk Park - all located within blocks of one another. Also in the area, the Chesapeake Energy Arena is home to Thunder, Oklahoma City's NBA team. Catch a game and follow it with a meal out at one of the incredible restaurants close by, such as Earl's Rib Palace and Pearl's Crabtown. For a little fun, check out Riversport Adventures OKC and for shopping, head to Penn Square Mall or Quails Spring Mall. If you desire some fresh air, explore Spring Creek Park on the shore of Arcadia Lake or Bluff Creek Park at Lake Hefner. - Suburban location in Edmond just 25 minutes from Oklahoma City, the Cox Convention Center, Chesapeake Energy Arena, along with great restaurants, shops and more! - Events allowed: Graduation parties, family gatherings, etc. This is a wonderful place to stay if you are ever within this area. Just a great experience that we had with our stay there. Would stay there if there was ever the opportunity to do so. This is a 5 Star facility! Lovely home with everything we needed! The home was perfect for our girls trip! The owner had a sweet note with fresh flowers and wine upon our arrival. The home was well stocked with everything we could possibly need. The home was spotless and the beds were super comfy. If I am in the area again, I will be sure to check if this home is available. Overall experience was fantastic!! Thank you!! We had a family of 7 adults at this home and we never ran into each other. Two full beautiful baths and the home had great function and flow. Each room quiet with plenty of privacy. Beautiful floor to ceiling windows and impeccably decorated with really nice furnishings. Looks and feels like a brand new home with sliding barn doors too. My favorite. Well equipped with anything you may have forgotten. The owner makes sure to provide more than one of the things that are used daily unlike other rentals. She has thought of every detail and even had fresh flowers upon our arrival. Beds and bedding were no comfy we all found it very hard to crawl out of bed. The owner is a pure delight to interact with and very personable and available by phone. We will definitely return to this home the next time we need to be in OKC/Edmond areas. Everything was so clean, all the beds were so comfortable! The house is even better than the pictures showed. The kitchen is stocked with everything you could ever need! Awesome Property with extremley helpful owner! The owner of this property takes pride in her property and you can tell by staying there. Everything is thought about ahead of time. Super clean, updated and very nice. I would stay here again in a heartbeart. The owner goes out of her way to make sure that you are comfortable. We asked if there was a pack and play in the house (we would have flown out with one), but she ended up buying one for the house. Great house if you have a toddler. Toddler friendly and a great beautiful backyard to run around in. Lots of dishes and everything you need. Wonderful stay and felt like I was at home. Clean and beautiful! Very comfortable and homey feel in a quiet neighborhood. Loved this property. We spent a girls weekend. Lots do to in Oklahoma City which was a quick drive but we found plenty to do in Edmond as well! We would definitely stay again when we are in the area. Carol checked in with me before we got there and was just a text/phone call away (although we didn’t need a thing!). We appreciated the hospitality and the home is even more beautiful than the pics!